[Artificial Intelligence] Q&A for people interested in conceptual questions about life and challenges in a world where "cognitive" functions can be mimicked in purely digital environment. [Data Science] Q&A for Data science professionals, Machine Learning specialists, and those interested in learning more about the field. [Cross Validated] Q&A for people interested in statistics, machine learning, data analysis, data mining, and data visualization. [Artificial Intelligence] For questions related to learning controlled by external positive reinforcement or negative feedback signal or both, where learning and use of what has been thus far learned occur concurrently. [Data Science] Area of machine learning concerned with how software agents ought to take actions in an environment so as to maximize some notion of cumulative reward. [Cross Validated] A set of dynamic strategies by which an algorithm can learn the structure of an environment online by adaptively taking actions associated with different rewards so as to maximize the rewards earned. While the site description for AI seems to invite only conceptual questions rather than specific or detailing ones, surveying the posted questions reveals a different trend. Q-Learning fails to converge even after 50K iterations for a simple board game - What could be the reason for this? These questions are quite specific and not conceptual (in a sense that they ask about implementation details or aspects specific to a problem). Surveying the first few pages of the reinforcement-learning tag at Data Science on the other hand created the impression of an excess of conceptual questions on that site and the same is observed for Cross Validated. All these sites support MathJax rendering, in favor of conceptual questions. ... which SE site should I prefer for posting that question? ... is there a preference regarding conceptual / (implementation-) specific questions? ... is cross-posting considered bad manners? Also are there any attempts in merging these SE sites into a single one, in order to merge the corresponding knowledge and competences? I posted this questions here, at Cross Validated Meta, because Cross Validated appeared topmost at SE sites, hosting most of the questions, considering the above three candidates. Machine learning, deep learning and reinforcement learning are all on-topic here, but we ask that questions not be primarily concerned with programming. I'm not active on DSCI.SE or AI.SE so I have no deep understanding of what is on-topic on those fora. However, I have been active on stats.SE for several years and I regularly participate in the review queues and meta.stats.SE. Moreover, my specialization is machine learning, neural networks and I've started learning about reinforcement learning, so I feel that I can speak to your question with respect to stats.SE. I've said it before and I'll say it again, "machine learning" and "data science" are terms that you use in place of "statistics" when you want to double the fees on your rate card. Machine learning is just another kind of statistical specialization, among other specializations such as time series analysis or mixed effects modeling. Despite its novelty, machine learning is concerned with core statistical concepts such as random variables, quantifying uncertainty, prediction and forecasts. In this light, questions about machine learning are squarely on-topic here. The main caveat to keep in mind is that questions which are primarily concerned with how to accomplish some task using a programming language are not on-topic here. This is because Stack Overflow already exists, and there would be no point in duplicating all of the "how do I __ in R?" and "how do I __ in sklearn?" questions here. These questions already have high-quality answers from programmers; why would you want another answer from a statistician? Our core competency is statistics, not programming. Most modern statistics involves some level of computer programming, so sometimes it is unclear where to draw the line, or the quoted code is purely incidental, or there are other reasons that a question that includes code is more about statistics than it is about programming. It's a subtle issue, and I encourage other reviewers to be thoughtful when considering whether a question that contains a code block is better open than closed. It's not clear where on the programming-statistics continuum your question falls. If you're trying to fix a bug, or improve the efficiency of code, that's probably off-topic at stats.SE, but if you have a question about statistics and code is more-or-less incidental or expository to your statistical question, then it's probably on-topic. One test I use when questions in the Close queue is whether the question is completely answered with some computer code; if it is, then the question is probably more about programming than statistics. Asking the exact same question in two or more fora is frowned upon because it duplicates effort. The only reason to ask similar questions in two places is because you want to have answers from clearly distinct perspectives. Glen_b came up with a nice example for this: suppose you ask a question about building a fence in your yard on DIY.SE (because you learn about home improvement), but you're not sure about the legal implications (because you don't want to annex some of your neighbor's yard); you ask a similar question on law.SE. This is fine, but do make it clear that you're interested in two distinct answers, one about home improvement and one about minimizing legal risk. Why do users face this trilemma? The creation of three distinct fora which largely overlap is very confusing to new users. It's the direct result of the Area51 process, which allows new SE websites to be created without the intervention of common sense. Simultaneously, hapless undergraduates are convinced that because "machine learning" and "data science" are courses taught in the computer science department of their universities, they must be wholly unique fields of study with only a historical relationship to the math or statistics departments; when these students are loosed upon the world, they carry with them their policing of disciplinary boundaries and zealously enforce their misconceptions when they graduate. It's also confusing to veteran users like me, because SE was designed around creating a durable repository of high-quality questions and answers; duplicate questions are addressed by closing questions as duplicates of the existing, high-quality content. Creating nearly-identical fora directly undermines that objective. My view is that SE websites should strive to be as mutually exclusive as possible. The SE team even built a feature to accommodate confused users: if users post a question in the wrong place, it can easily be migrated to the correct forum. AI.SE and DSCI.SE would be valuable additions to the SE network if their focus were on the topics not covered by stats.SE. I'm hard-pressed to find a question that is on-topic here but not on-topic at DSCI.SE; does this imply that we should duplicate every question and every answer on DSCI.SE? If not, why does it exist? If so, why does it exist? As it stands, the only reason for DSCI.SE to exist is to accommodate users unfamiliar with the term "statistics," but we can easily fix that by redirecting DSCI.SE.com to stats.SE.com. When considering arguments in favor of DSCI.SE, one quickly realizes that the same arguments can argue in favor of creating time-series.SE, spatial-data.SE, bayes.SE, missing-data.SE, regression.SE, probability.SE and a specialized SE website for every other statistical topic. I can see no useful purpose for such fine-grained distinctions. Moreover, time-series.SE and spatial-data.SE leave no obvious home for spatio-temporal questions, which can find a home in neither because it includes both topics. Users will be fragmented across the statistical archipelago; total traffic to each website will be much smaller; more questions will be posted to the wrong fora to the consternation of all involved; all users will chafe under the pointless friction of this system and depart for Reddit, Twitter, Quora or Yahoo! Answers. I quite regularly visit SE DataScience, SE StackOverflow and SE CrossValidated. I often have the impression that some question fits best on another SE platform but usually the person is kindly asked to place the question elsewhere. 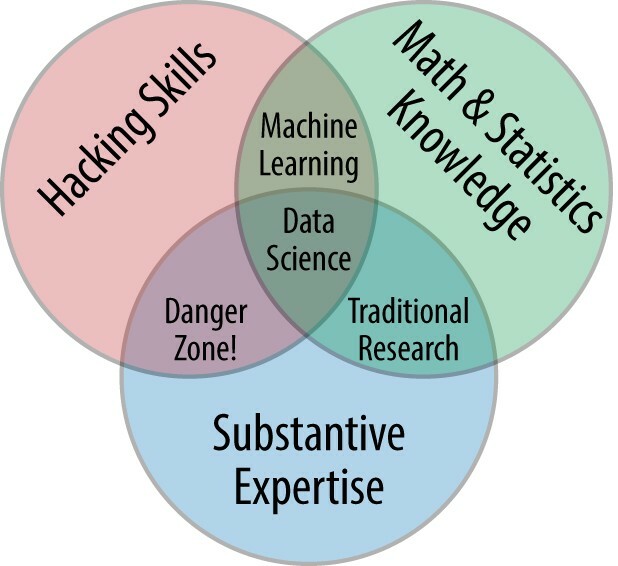 The term data science per se generates some misunderstanding, but I think we can agree that it has now acquired much more sense. Looking at the famous McConway diagram, which has now been updated or simply modified by several people, the field is defined according to the interplay of three main sets of skills which are partly related to different SE platforms: coding (SE StackOverflow), math (SE Mathematics) & statistics (SE CrossValidated), subject expertise. For me a good question on SE DataScience is one related to the availability or best use of routines/packages for doing some task. Not the answer you're looking for? Browse other questions tagged discussion on-topic cross-posting datascience-stackexchange ai-stackexchange .